LibreOffice is a free and open source office suite, developed by The Document Foundation. It is developed from Openoffice.org. You may know well about OpenOffice but never hear about LibreOffice. All in all, they work almost the same but Libreoffice has more advantages. Free Flippagemaker Flipbook Maker for LibreOffice is flippingbook maker for designing LibreOffice into digital flipping magazine. It is free flip page maker that enables you to customize your flip book carefully. This excellent freeware give normal pages stunning flash flip character. You can import any comprehensive LibreOffice document and retain its complete content. Display Libreoffice file online and offline as a real book can give much more joy than only show it simply as normal e-document. Transform imported file into flipping book in html, zip, or exe format are all possible. Now please go ahead know more about its detail features in the following list. 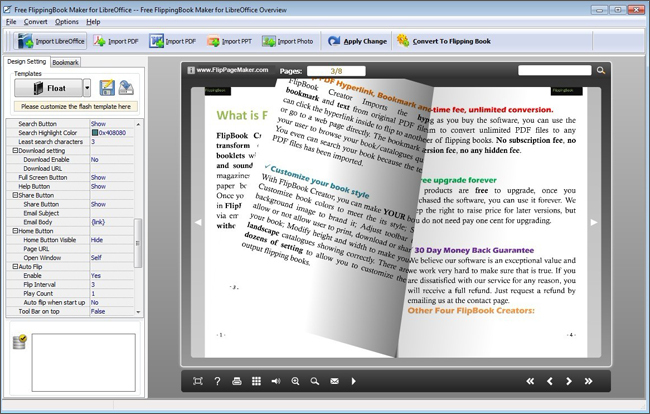 Flippagemaker Flipbook Maker for LibreOffice makes it easy for you to create realistic flash page-flipping book without any skills. The original document needs to open with LibreOffice suite, and scroll mouse to view page by page. But if you convert it to flipping book, it will bring you amazing experience. Tailor the flipbook Float templateFloat template is flexible template to show features of flipbook. In the left of the window, you can tailor all settings for the template. Generally, you can import background images, insert a piece of background music, and change the book title. These three parts are important as they determine the out looking of flipbook. Of course, to enable features, you need to show and customize buttons in toolbar, such as Auto Flip, Share Button, Home Button, and so on. When necessary, you can set security password for the exported book.